So, you’re a month into the school routine, and maybe you’re starting to feel the excitement wear off and the fatigue set in. You might ask yourself: What could make preparing those lunch box meals easier, and what could make your kids want to eat them? Anyway, FunBites is the first state of the art kitchen tool that instantly cuts kids’ food into bite-sized, fun-shaped pieces. This product is made in the USA and is BPA free. They are perfect to get even the pickiest eaters to try something new and eat healthier. FunBites come in three shapes: square, heart or triangle. We have the square and triangle sets, and I love them. It makes splitting a grilled cheese evenly between the twins much easier and quicker than using a knife and “eye-balling” it. 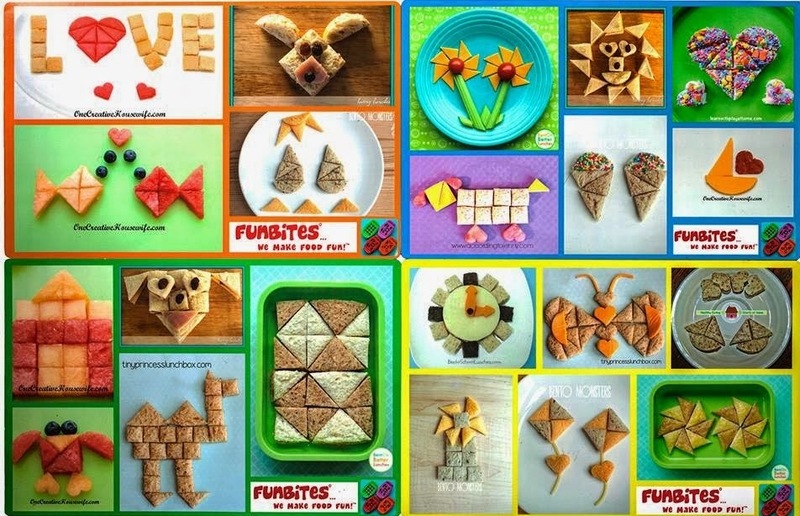 You could also use it to cut cheese, fruits, veggies and anything you can think of into shapes to create cute layouts like the ones pictured below. You can win a FunBites by entering the giveaway below. Follow FunBites on Twitter, Facebook and Instagram. Love, love, love Funbites! The Kids are at the age where they can make their own shapes and I’m all for having them learn.